The Chesapeake Bay is the largest estuary in the United States. 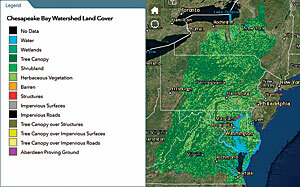 To support watershed and storm water management and conservation for this vast area, as well as reduce pollution of the bay, the Chesapeake Conservancy, a nonprofit organization, needed to produce one-meter-resolution land-cover maps covering the 100,000 square miles of the Chesapeake Bay watershed. Working in partnership with the University of Vermont and WorldView Solutions, the Chesapeake Conservancy needed to process over 20 terabytes of raster data and categorize it into 12 land-cover types to produce this essential dataset. This monumental project was completed using local machine resources in 2016 after 10 months. However, this land-use dataset needs to be updated frequently to account for the annual addition of 100,000 new residents, supporting infrastructure, services, and businesses. The costs in dollars and time to produce updates was too high using local machine resources. The Chesapeake Conservancy needed a way to quickly produce updates in a semiautomated manner. 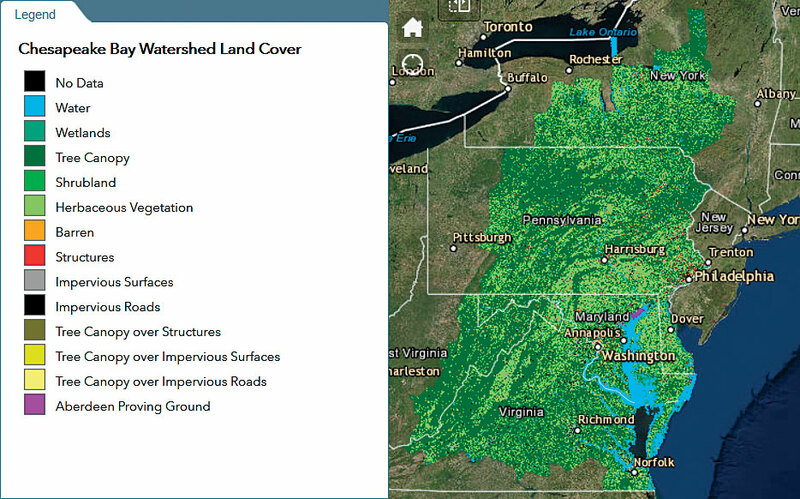 The Chesapeake Conservancy is performing the land-cover updates using raster analytics in the cloud, a methodology that is more efficient and cost-effective. Processing chain templates built using ArcGIS Pro perform preprocessing, image segmentation, and random trees classification. The jobs are submitted from ArcGIS Pro to the portal, which manages the distributed processing, storage, and publication of results in the cloud. Using raster analytics in the cloud, two terabytes of National Agriculture Imagery Program (NAIP) multispectral imagery are processed into the classification schema in 150 hours. Previously, using local machines, the same job took more than 2,500 hours—or three and a half months—to process. The Chesapeake Conservancy can accomplish updates in a timely and cost-effective manner, without having to spend resources to acquire, configure, and maintain a large computing and storage infrastructure locally.